Mary Green looks at the bright flowers of the early summertime. We have had mixed fortunes through the late spring, with some unseasonable frosts, plenty of sun and not much rain. Hopefully, the plant and animal life around us will have survived all this and be out in force in June. Our local swan pair has six cygnets, ducklings are appearing every day, moorhens and geese are nesting, and the song birds seem to be in especially good voice this year. May blossom came out over a long period and was spectacular in the sun. I heard the cuckoo near Bittell – that’s three years running, and a very good sign. June is a time of such full flower that it includes all the colours of the rainbow. It is the peak of flower, and the number of species in bloom starts to slow down afterwards. It’s also the time for reds and pinks especially, which are less common earlier in the year. Insects are out in force, the bees and butterflies loving all these brightly-coloured flowers. The first flower of June is of course the rose. Wild roses are, to me, equally as attractive as garden roses, though they don’t stay in flower for long. So it’s nice to have some of the old-fashioned climbing garden roses too, some of which escape into the countryside. Roses have been cultivated from way back in the middle ages, so we feel that the more showy pink, red and yellow varieties are part of the English scene even though they aren’t native. Our wild native roses include the dog rose, field rose, sweet briar and downy rose. The two which are common round here are the pink dog rose and the white field rose. There is no wild red rose, but the downy rose, rosa sherardii, which grows in the north of England and Scotland, is a very dark pink. The pale pink dog rose (rosa canina) is the first native rose to flower here, climbing around hedges and trees to find the light. It doesn’t have much scent (like the dog violet: the name “dog” indicating an ordinary run-of-the mill variety). The deeper pink sweet briar (rosa rubiginosa), which you will see in areas of chalky soil but not around here, has scent in the flowers and the leaves. Slightly later comes the pure white field rose (rosa arvensis), again not much scented, but very attractive, and common round here. It is thought to be the origin of the white rose, rosa alba, which became the rose of York. There’s another rose not common around here but which you might see if you visit the seaside. I’ve seen it on dunes in Devon, Northumberland and Dumfriesshire. It’s the small low-growing burnet rose, with a pretty open small creamy-white flower. Unlike the others it doesn’t climb; it doesn’t need to because it grows out in the open sunlight. Honeysuckle, though, does need to climb to the light, and scents the air in June. With the roses come the orchids. Again I think the native ones are just as lovely as the flashy cultivated ones, though smaller. The common spotted orchid isn’t that common now, but there are lots at Eades Meadow and some on greens and roadside verges – and in quite a few people’s gardens. The leaves are spotted and the thickly-clustered pink flowers can grow quite tall. There are remnants of them all over the place here, and they must have filled the fields at one time, till modern farming methods drove them out. However, some farmers now are reintroducing species-rich grassland for better meat production and environmental diversity, so orchids are slowly making a comeback. The bee orchid looks like a furry bumblebee with pink wings, quite unmistakable. I hope it comes back near the canal, where it survives except when the mowing regimen goes wrong. In past years the village green at Romsley has had both of these orchids, but not every year. They like meadowland, which means the land should be fairly damp and grazed or cut in winter but left to grow in the spring and summer. I know a garden in Alvechurch which is full of bee orchids. In Eades Meadow there is another one, the fragrant orchid. This is a thinner, more delicate spike of pink flowers than the common spotted, and you have to get down and sniff it to identify it – it smells gorgeous. Nearby is another pink flower, the ragged robin. This was once very common and still is in parts of Ireland and Scotland. It is like red campion, but ragged, and grows in wet undisturbed places. There is a lovely patch in the local wildlife site field at the top of Fox Hill near Alvechurch – you can spot it if you lean on the gate! This same field also has betony, another pink/red flower, a herb in the sage family. It’s a dark purplish pink, quite uncommon nowadays but showing where land is left undisturbed. You can also see it in the Old Orchard near Barnt Green. Here it grows among tufts of tormentil, a lovely yellow flower that forms rounded clumps like embroidered cushions. That’s why the best places to see poppies are places like the Wildlife Trust’s farm near Bewdley, opposite the Blackstone car park. Here you can see the whole range of arable-loving wildflowers: not just poppies but camomile, wild radish, scarlet pimpernel, heartsease and many others. Poppies depend upon the ground being ploughed up each year, so they have traditionally accompanied the farming of corn and other edible crops like beans. 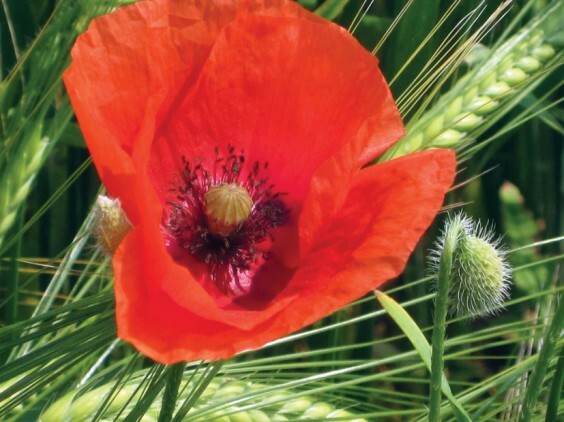 However, modern farming uses weedkillers and poppies are “weeds”, like all native flowers. They are popular in wildflower mixes for gardens, but often disappoint as they may only flower one year. The seeds can, however, last in the ground for years and come back when the land is disturbed. The poppies in the battlefields of the First World War show their affinity to disturbed soil, and strengthened their already-existing mythical link with death. Our wild poppy is bright scarlet and single, so any others are likely to be garden escapes. However, there is a bright yellow one, the Welsh poppy, which is native in Wales and the south-west of England but introduced around here. Most of these bright flowers rely on colour to attract insects, and even on looking like insects in the case of the bee-orchid. Another really common June flower relies more on its scent. This is the elderflower, which replaces the hawthorn as the frothy white flower of the hedges. We all know elderflower cordial, one of the few still-popular drinks from a long tradition of flower and fruit cordials and teas. The flowers smell sweet and honeyed, and can be used to cook with and sweeten fruit – especially gooseberries which fruit when the elder flowers. Anywhere near water there is another creamy, frothy flower with a honeyed scent – meadowsweet. It can be used as a sweetener too, and was once used to flavour mead and ale, to strew on floors to perfume the house, and as a medicine against colds, pains and fevers. The latter use is not surprising as it contains aspirin, in a readily digestible form, and one of the most effective of the old herbal remedies. Among these flowers is another bold yellow one, the wild iris or yellow flag. This showy flower, which later has poisonous red berries, is often mistakenly thought to be a garden flower, but is a true native. So is the foxglove, another dramatic June flower, much loved by bees but poisonous. However, the drug in it, digitalis, is used in small quantities for heart problems. In the water, June is when the water lilies appear. Round here the most common is the yellow one, but there is a lovely white one too. It seems everywhere is full of colour. Enjoy the colours of June, and I hope it is flaming in other ways too. Here is a poem about one of my old-fashioned garden roses. My wild garden is open as part of the Withybed open gardens this year. Appear from June to autumn without fail. When I wasn’t looking, too full of work. And all the aphids did was attract songbirds. Nothing would halt the annual pink outbursts. For centuries, a flower which speaks of home.